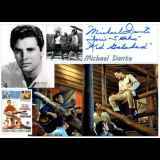 Michael Dante is an American award-winning actor of television, films and stage and a former professional minor league baseball player. As a boy growing up on the West Side neighborhood of Stamford, he would sneak into a local movie theater with his friends to watch westerns. "I grew up wanting to be the sidekick of The Lone Ranger and wanting to follow my heroes," Dante told a reporter in 2006. He was a shortstop on the Stamford High School baseball team, then played for "The Advocate All-Stars" team which won a 1949 New England baseball championship. After graduating from high school, Dante signed a bonus contract with the Boston Braves. He used his $6,000 bonus went to buy his family a four-door Buick with whitewalls. New Response (Success): Sent, 8x10, LOR, SASE & $20 - received my 8x10 bac..